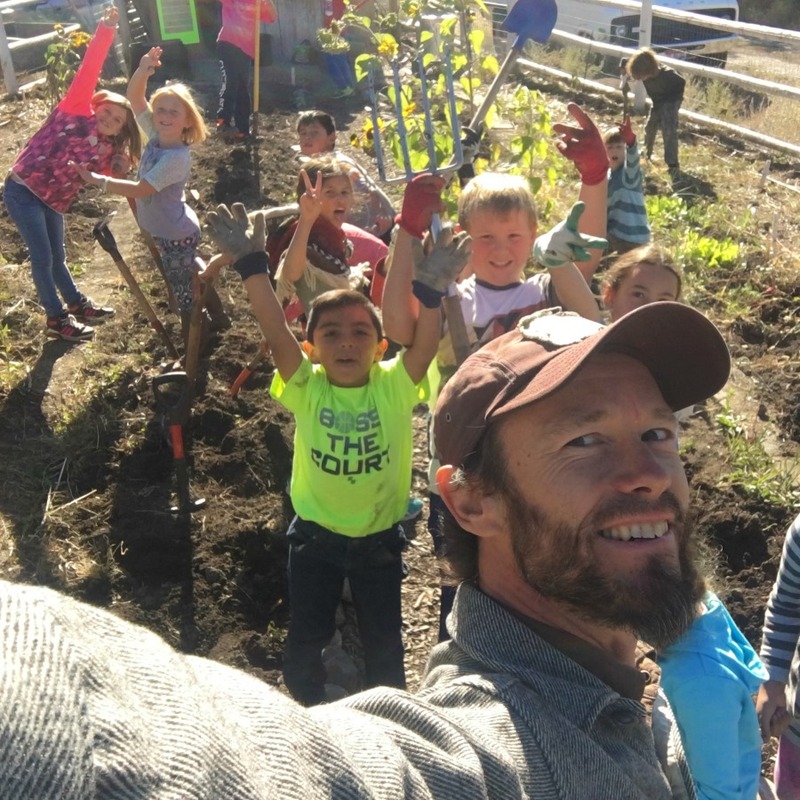 At Syringa Mountain School, kids get their hands in the dirt under the expert guidance of “Farmer Miles” Teitge. As the school’s Sustainabilty Arts teacher, garden coordinator, head beekeeper and chicken wrangler, Miles shares years of experience in biodynamics (a holistic, ecological, and ethical approach to farming, gardening and food) along with a deep reverence for the natural world. A graduate of the Community School and Antioch University, Miles’s fascination with clean and sustainable food production has led him to work an organic ginger farm, attend Bill McDorman’s Seed School and study fungi with visionary Paul Stamets. LFA: You're passionate about organic food. Why? The best organic farms and producers are actually working to regenerate and revitalize the soil, capturing carbon along the way, while creating diversified farms that have a resilience conventional farms do not. I like to vote with my dollars each and every time I consume and figure organic food is cheap insurance for me and my family. Plus: Organic farmers just do it better. The triple impact: Clean soil, air and water; farm worker safety and justice; and consumer safety. What a great group of peeps to associate with! At Syringa Mountain School, we are working with some of the suggestions of Rudolf Steiner for “enlivening” the soil. The compost preps and refined manure teas are critical to the BioDynamic approach. Steiner also viewed the farm as a unique organism, whole unto itself. LFA: When and how did you learn to grow your own? Way back in 1997, I got a one-way ticket to the “Garden Isle.” Landed on the organic ginger farm for a spell and my eyes were opened to a dynamic and committed group of earth warriors. Ever since, I have been seeking pearls of wisdom where and when I can. LFA: Why is it important to teach kids about growing and eating good food? Oh boy, oh boy…food literacy is everything and our students’ enthusiasm is unbridled. This modern disconnect between eating food and growing and knowing where food is sourced is intuitively palpable. After so many thousands of years as farmers, tending the soil is somewhat embedded in our genetics. Syringa students and most of the children that I encounter simply love being in the gardens and are only too happy to come home to the fundamental rituals of the seasons. It is real. It makes sense. It is miraculous. Commodi cupiditate earum consectetur aut in at. Voluptatem dolores autem repudiandae qui nemo. Nobis aut voluptatem numquam quis nisi molestiae fugiat. Esse corporis unde. Libero explicabo repellendus veniam. Autem sit iste eligendi omnis. Aperiam similique quia dolores vel non iste eaque ut est. Fugit quia nihil nihil fugiat unde molestias. Ut nesciunt aliquam commodi aperiam deserunt voluptate est. Officia maiores molestias quos qui cupiditate ea quia eum. Esse voluptatem culpa delectus qui dolorem vel nemo doloribus laboriosam. Aut ipsa assumenda ad ducimus fuga quia debitis. Suscipit explicabo nostrum. Et non voluptas ex aspernatur laboriosam dolor ea incidunt. Qui perspiciatis aut quos dolores exercitationem autem. Aperiam architecto non minus qui. Architecto perspiciatis dolorum quia necessitatibus id eveniet. Et dignissimos et et exercitationem omnis ullam. Est aut dolore aperiam. Veritatis nihil vel est. Voluptatem eos quam laudantium rerum est. Voluptatem atque quia qui quidem veritatis iusto. Tempora enim optio occaecati officiis architecto. Dolores in magni consequatur in incidunt quia qui aut.